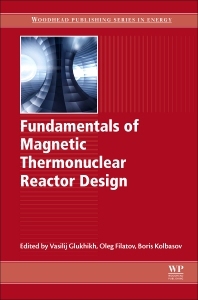 Fundamentals of Magnetic Thermonuclear Reactor Design is a comprehensive resource on fusion technology and energy systems written by renowned scientists and engineers from the Russian nuclear industry. It brings together a wealth of invaluable experience and knowledge on controlled thermonuclear fusion (CTF) facilities with magnetic plasma confinement – from the first semi-commercial tokamak T-3, to the multi-billion international experimental thermonuclear reactor ITER, now in construction in France. As the INTOR and ITER projects have made an immense contribution in the past few decades, this book focuses on its practical engineering aspects and the basics of technical physics and electrical engineering. Users will gain an understanding of the key ratios between plasma and technical parameters, design streamlining algorithms and engineering solutions. Dr. Glukhikh graduated from Tomsk Polytechnic Institute with an Engineering Physics honours diploma and joined the Efremov Scientific Research Institute of Electrophysical Apparatus as an Engineer. He was later promoted to Senior Engineer, Laboratory Head and then Deputy Director. He held the position of Director of the institute from 2974 to 2003, before becoming a scientific supervisor until 2016. Dr. Glukhikh was also a Professor and Associate Member of the USSR Academy of Science and a Member of the Academy of Sciences, before becoming the head of development of the first Soviet toroidal fusion facility Alpha, tokamaks T-15 and TSP and inertial fusion facility Angara-5. He has been awarded the Prize of the International Association of Fusion Scientists (1986), Lenin Prize (1984), State Prizes of the USSR (1972) and Russia (1997), 5 orders and several medals. Dr. Filatov graduation from Leningrad Polytechnic Institute with an Engineering Physics diploma in Thermal Physics, before joining the D.V. Efremov Scientific Research Institute of Electrophysical Apparatus (Efremov Institute) as an engineer. He was shortly promoted to Senior Research Fellow and was the Efremov Institute Director General between 2003 and 2016. Dr. Filatov is currently Scientific Supervisor at the Efremov Institute and is a member of the A.M. Prokhorov Academy of Engineering Sciences. He lead the Russian member team of the ITER international project and has received various awards such as the S. Rose diploma of honour in1992, and the Russian Federation awards: the Medal of the Order "For Merit to the Fatherland”, the “Academician I.V. Kurchatov” third class medal, the I.V. Kurchatov gold medal and D.V. Efremov prize. Dr. Kolbasov graduated from Moscow Mechanical Institute with an honours diploma in Design, manufacture and utilization of physical devices and facilities before becoming a Reseach Fellow and then Senior Engineer at the Institute of Atomic Energy, Moscow, where he was responsible for developing gas-cooled power reactors. He then became Senior Research Fellow and head of a fusion reactor engineering and physical study group at the I.V. Kurchatov Institute of Atomic Energy (KIAE), before becoming Laboratory Head, Deputy Head of the Fusion Engineering and Physical Study Division at KIAE where he participated in the development of the INTOR, OTR, and ITER fusion reactors. Dr. Kolbasov is currently Senior Research Fellow at the National Research Centre “Kurchatov Institute” where he is responsible for the development of the DEMO-TIN fusion neutron source, and is also the deputy editor-in-chief for a Russian-language journal. He has received many awards including the Presidium of the Supreme Soviet of the USSR, the President of the Russian Federation and the Ministry of Atomic Energy (1970, 1985, 1997,and 1998).